Ferguson October protesters want football fans to know that "Black lives matter, on and off the field." Sorry to inconvenience the 3rd quarter, but the wild cheering of African-American athletes who can run fast, and the death and disrespect of Mike Brown simply cannot be separated from each other. Black lives must matter on AND off the field. We witnessed many hateful, hostile, and nearly violent responses from fans inside and outside the stadium. 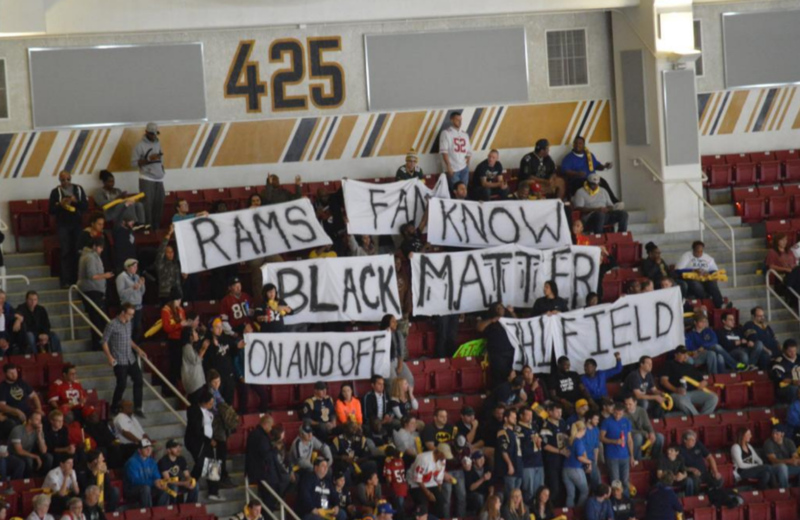 But we witnessed many Rams fans – including many white fans — who joined our protest in solidarity after initial hesitance. It's almost like they needed permission to show their justifiable outrage. Last week the St. Louis Symphony protesters asked 'What side are you on, my friends. That's the question. There are six witnesses, no police incident report, still no arrest, and Mike Browns in every town. This is real basic. There can be no fence-sitting here. Dismantling the Blue Wall of Silence also includes ending white walls of silence. As one stadium protester who requested anonymity told me, "Tonight was a major success. Our message was clear – black lives matter and that means that police violence is an issue no one can ignore, even during Monday night football. Our movement is growing every day and while ESPN chose not to air our major action, we know that many in our country stand with us. We are waiting for our leaders to act."